paper & ink: make something! 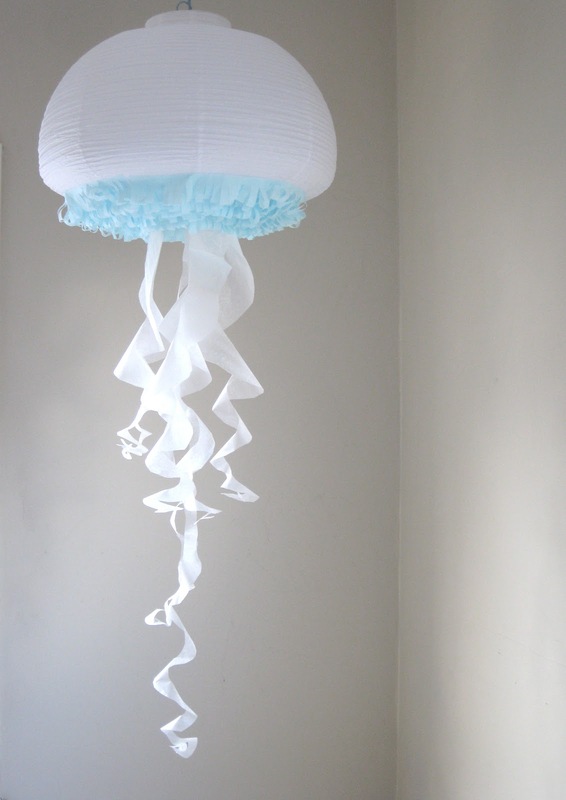 make this jellyfish light for your little one! when i started on the diy project for design*sponge last month, the early stages of the "pinata inspired party lighting" reminded me of floaty little jellyfish. ikea carries a couple of different shapes of paper lanterns. 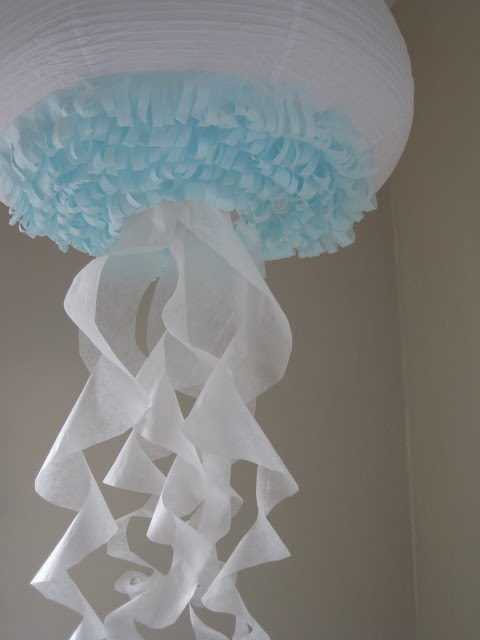 one of each would make a perfect grouped trio of jellyfish hanging in your child's sea themed bedroom. 1. follow the directions on design*sponge to create the fringe for the bottom of the jellyfish. 2. glue only a few rows of fringe on the bottom of the lantern. 3. to create the tentacles... i used waxed white tissue paper. (regular tissue will work just fine if you can't find waxed) start with a circle about 6-8 inches in diameter. using scissors, cut in from the outer edge of the circle in a spiral pattern, starting wide and tapering the width of the tentacle as you cut toward the center of the circle. 4. tape or glue the wide end of the tissue spiral to the bottom ring of the paper lantern. 5. repeat step 3 to make more tentacles. tape or glue them all around the edge of the bottom circle of the lantern and also on the bar that stretches across the circle. you are done! I'm so glad you posted this! I'm working on an Under the Sea mood board. How did you flatten the lower side of the lantern? The one I made retained its round shape and looks less like a jellyfish. it is actually a shaped lantern from ikea. it came with a sort of flattened bottom. i would try using some wire and attaching it to the bottom of the lantern, then thread it through, pull as much as you need and attach it to the top. it may help the shape. any worries about catching fire? (The blue fringe part - I have one of these IKEA lamps so not worried about that). the blue fringe is outside of the actual paper lantern, so it not any closer than the paper of the original lantern would be. be sure that the bulb doesn't touch any part of the paper lantern, and if you are all concerned, treat it like a candle and don't leave it on while it is unattended.